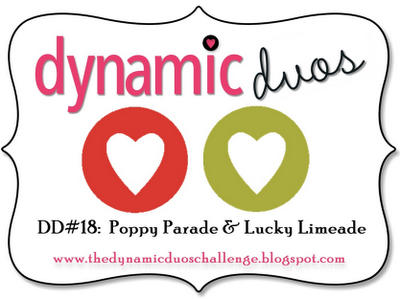 We are having a Bold & Sassy Color Duo this week at Dynamic Duos! The featured colors are Poppy Parade and Lucky Limeade. I just happened to have both colors in my stash! Don't worry, if you do not have the posted colors....make your creation with the closest shades that you have! All products are welcome in the challenge! 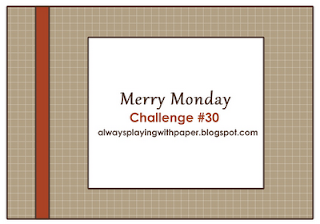 I created my card with help from the sketch this week at Merry Monday. I flipped the sketch and used my ornament in place of the square. I kept my card on the clean and simple side, in part to show off the lovely ornament and my double bow! I can't decide which I like more, the bow or the ornament! I am a huge fan of bows....but must admit, I am bow impaired! The vast majority of bows you see on my cards are made with a Bow Easy. It was the best $5 I ever spent! I don't recall where I purchased it....but many stores sell them online. My ornament was cut with the Cricut Art Philosophy cartridge. I then stamped with the coordinating stamp set, Ornamental Cheer. After stamping, I ran the ornament through my Xyron machine to get a even layer of adhesive, then covered with prisma glitter. The shimmer is hard to capture in the photo, but the ornament really shines in person. Ornamental Cheer is a collection of stamps that coordinate with the Cricut Art Philosophy cartridge. You can make quick and easy Christmas cards or even decorations for your tree! Here is a photo of the full set. The images with lines around them indicate there is a Cricut shape to coordinate with the stamped image. I added a single strip of ribbon to finish out the inside of the card. Thanks for stopping by. Be sure and stop by Dynamic Duos to see all of the creations by the Design Team. You have until Thursday at noon (PDT) to enter your creation! So pretty and festive Allisa! Have a great holiday weekend! Beautiful card, and your ribbon/bow is perfection, Allisa! Thanks so much for sharing this with us at the Simon Says Stamp challenge! Simply beautiful, Allisa. I love the embossing and how you finished off the inside as well. Thanks for joining us at Avadares Challenge Blog and thanks for following too. Absolutely gorgeous! Love that fabulous bow and the pretty brad in the middle. The whole card is lovely, but I have to say that I have never made a bow that gorgeous!! Tee hee hee - I'm 'bow impaired' as well, and if I HAVE to add a bow ... I use my Bow Easy. I was looking at your card before I read your post, and was thinking "WOW - Allisa does AMAZING bows!" Wonderful card, the embossed background adds to much to the finished card. 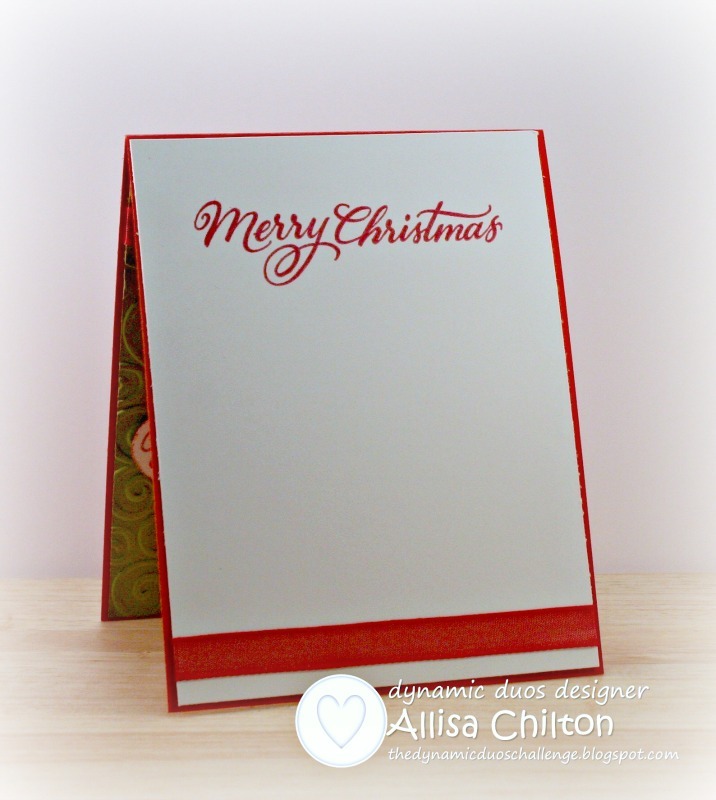 Fabulous Christmas card Allisa, love the traditional colours and embossing, gorgeous sparkle and bow, even with a bow maker I can't do that.. Thanks for sharing with us at Crafty Sentiments Designs..
Love your card, so very Christmasy. Great Christmas Card. Thanks for playing along with us at the Creative Card Crew. Fabulous CAS design! I love the texture the embossing adds to this design; it is a nice contrast to the glitter. Fabulous composition and wonderful design point of view! Thanks for sharing with us at Stamp-N-Doodle! 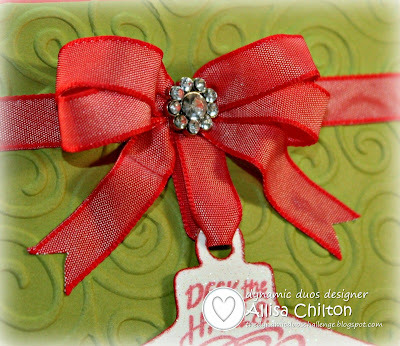 Gorgeous card Allisa, your bow and ribbon are so beautiful and I love the rich colours. Thank you for joining us for Merry Monday this week. I can't decide if I like the ornament or the bow better either. Both are gorgeous! Another fabulous card, Allisa! Thanks for sharing it with us at Merry Monday! Lovely holiday card and beautifully CAS. Thanks for joining in on the fun at Avadares. We look forward to seeing you again, using an Avadares images. What lovely colors. Thanks for joining in our challenge this fortnight at Creative Card Crew. Beautiful, Allisa! Those are perfect colors for Christmas! Allisa, all I can say is this card is simply stunning, I just love it. Very pretty card, and I really like the bow! Amazing...do I say that every time? Wow Allisa, your double bow is spectacular, I just love this beautiful card! Thanks for joining us at Merry Monday! Allisa your card is just stunning! I love the embossed background. This is gorgeous, love everything about it...Thanks for sharing with us at Aud Sentiments. Gorgeous ornament and a very pretty card!